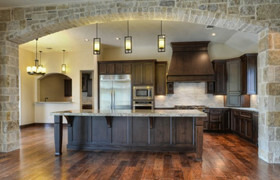 S Barry Signature Homes was established in 2006 to offer fine quality custom homes throughout central and south Texas. Founded with a strong commitment to excellence and dedicated quality through passion for design and innovative architecture. Our mission is to deliver a quality home with the latest in design, technology, and your merging home with local flair and environment. Our passion for style and rigorous search for the finest materials and contractors gives our homeowners peace of mind and confidence. Our focus is customer satisfaction by achieving customer expectations in keeping them informed with every step of the building process through completion and continuing an ongoing customer relationship for future reference, follow-up, and recommendations. Green Building is best defined as building an efficient, environmentally friendly home. This process is broken up into three categories. Thinking of the environmental impact your home will create as well as a minimal environmental impact from materials used. This includes using local origins on materials and renewable resources. Energy efficiency from electrical, gas and water conservation. Using the correct building materials in conjunction with upgraded insulation and new technologies in A/C, solar, roof, lighting and the use of renewable energy. Health. Green Homes have the proper air flow and reduction of VOC (Volatile Organic Compounds) used in some materials in the building process from adhesives, paints, etc.